The birthplace of Jirocho (次郎長生家) is located in Shimizu, Shizuoka. It is the traditional houses that has a great structure of Meiji period. The well that used for Jirocho's birth is still remains as it's used to be. Close: Monday, next day of holiday. 0. at JR Shimizu Station. 1. use local bus to Minatobashi. The birthplace of Jirocho still remains the structure of Jirocho's house in time. The well is exactly the same as it's used to be. It has great view of early Meiji period. It displays also many photo of Jirocho, tools and other items. It has also craft gift shop. Yamamoto Chogoro, aka Shimizu Jirocho, is the famous Youxia in late Edo period to beginning of Meiji period. He was popular No.1 lord of Youxia of Tokaido. 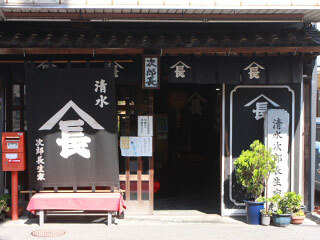 He was born as the 2nd son of Takagi Sanuemon who was the captain of fisher shop in 1820. In 1843, Jirocho left his house with his followers because he committed murder and traveled all over Japan. As Youxia, he beat bad guys and helped weak persons. This story became popular Samurai Story. In 1868, he was assigned as the chief police force of Tokaido around Sumpu town. In the same year, the admiral Enomoto of old Tokugawa government left his fleet from Shinagawa Bay. One of his battle ship lost by storm, and escaped to Shimizu Bay. But all the crew was killed by New Meiji Government. The corpses were exposed under the weather because they are serious rebels agains government. Jirocho gathered those poor corpses and buried agains the order of the government. They tried to stop him, but he ignored them because there were no difference in poor died person between new or old government. After this event, he made a great friendship between Enomoto Takeaki and Yamaoka Tesshu who is one of the hero of Meiji Restoration. Jirocho was used to be a serious gambling addict. After he he quit gambling and started supporting the development of Shimizu Bay. He also opened shipping agency and private English school for youth.